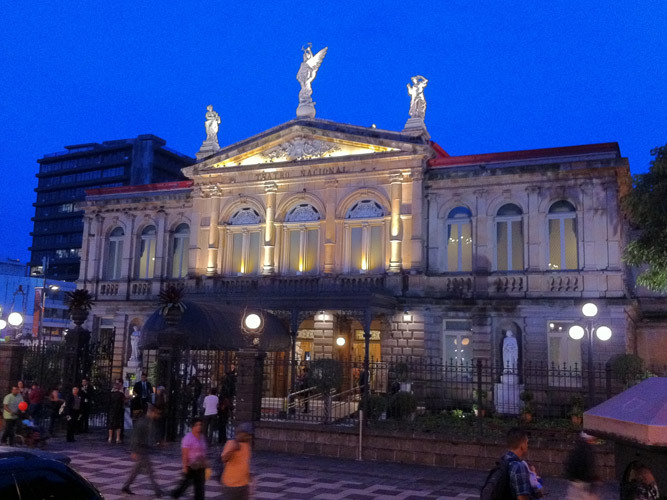 Arrive to San Jose for a quick stay in the country’s capital. An airport shuttle to the hotel can be provided at an additional charge. That or the hotel is a quick hotel ride away. We’ll make sure you get a taste of Costa Rican culture right away. It’s that time again, when we all reconnect with old friends AND meet a ton of new ones. No race today. It’s a day for registration, exploring the city, and sitting poolside at our first hotel. Yes, a cocktail or two won’t hurt before tomorrow’s first run! It’s an early start to kick off the adventure in Costa Rica. We’ll board the buses at 7am and be off to Mundo de Aventuro Park! We’re not ones to dip our toe in adventure. We’re pretty much ready to dive in head first! Our morning run will have the Arenal volcano as a backdrop. 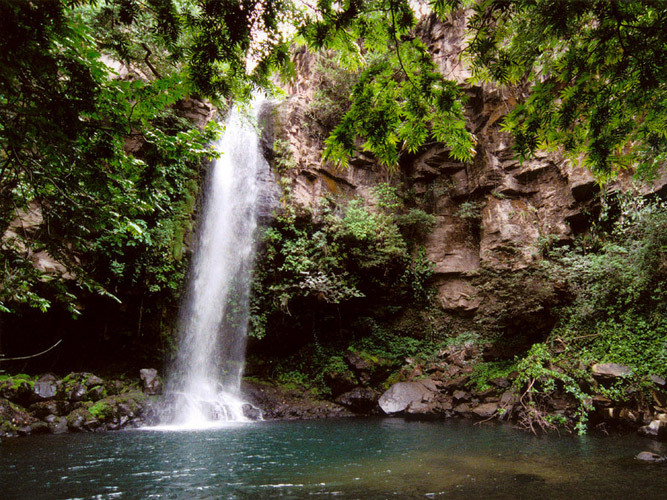 After, we’re going straight for a waterfall and canopy tour. Zipping through the trees will be your right of passage into all Costa Rica has to offer in the way of adventure. Our home for the evening is the famed Baldi Hot Springs. 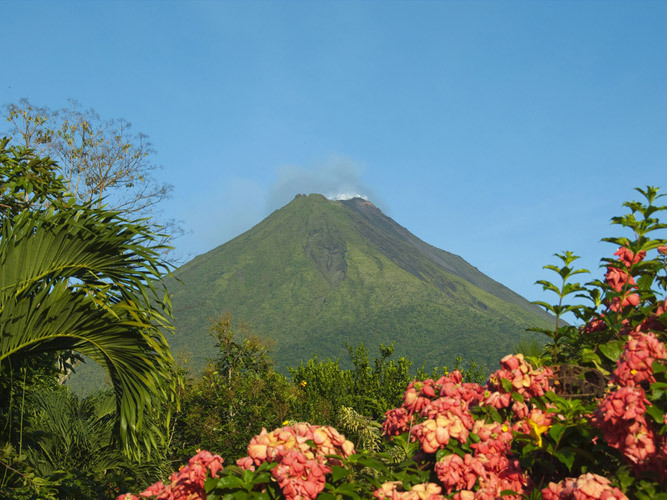 Baldi is located in La Fortuna de San Carlos, Costa Rica at the base of the Arenal Volcano and is surrounded by nature. 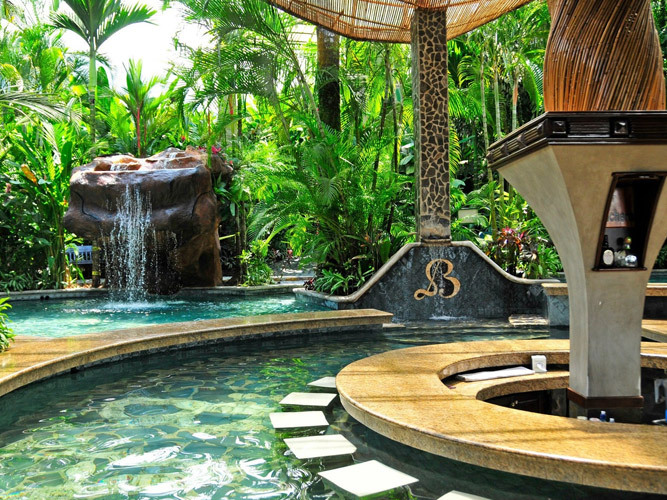 On property you’ll find 25 pools of thermal water, rich in minerals and healing properties. Rest those legs in the springs or by the pool bar, but rest them nonetheless. We’re just getting started. Dinner is served at the resort that evening. 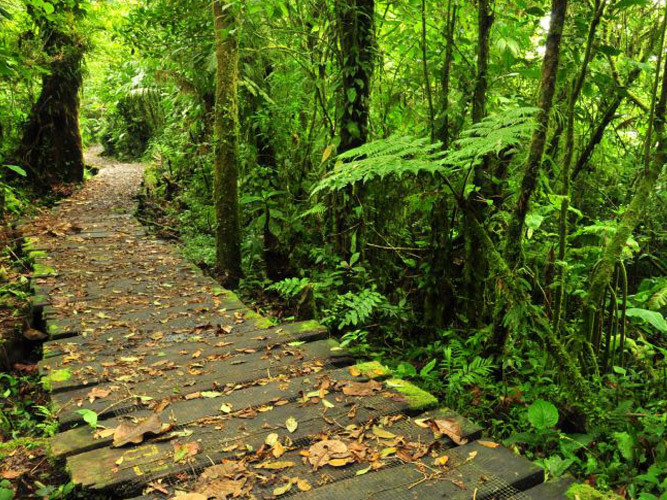 Our next trail adventure will take us from Lake Arenal up to the Monteverde Cloud Forest! We’ll wind up at the Selvatura Adventure Park. 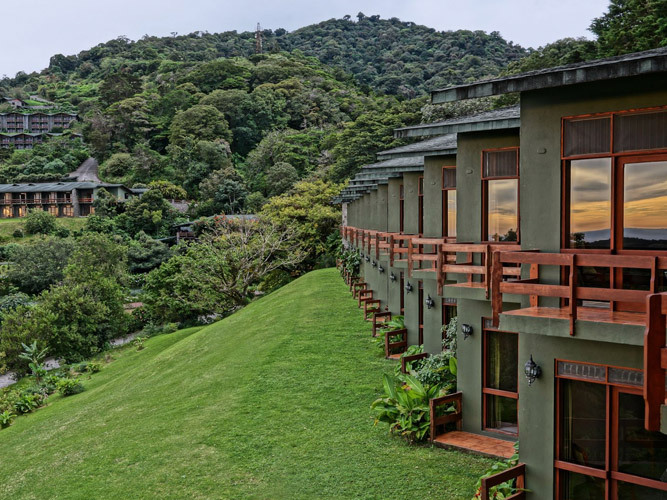 Selvatura is an eco Adventure Theme Park dedicated to give visitors a chance to experience the cloud forest and enjoy its fun and adventurous activities. After lunch among the butterflies and hummingbirds, we’ll be checking in early to the Establo Hotel. Known for its stunning mountainous views, there is tons to do here, nothing to do here, and plenty to see off the grounds. Enjoy the local coffee shops, play tennis or soccer on site, or simply grab a cocktail, hang by the pool, and enjoy the pool. You’re on your own for dinner tonight, but we’ll all plan to meet up at Bar Amigos, the best disco in town! That or get an early nights sleep, and be refreshed for another big day ahead. It’s time to depart from the interior of Costa Rica and head to Ocotal Beach! Run #3 has us running through the adventure park of Eco Diamante. Little known fact – this is also the stomping grounds of one of our own, Luciana Smania! Eco Diamante is her day job and she’s going to give us the royal treatment. 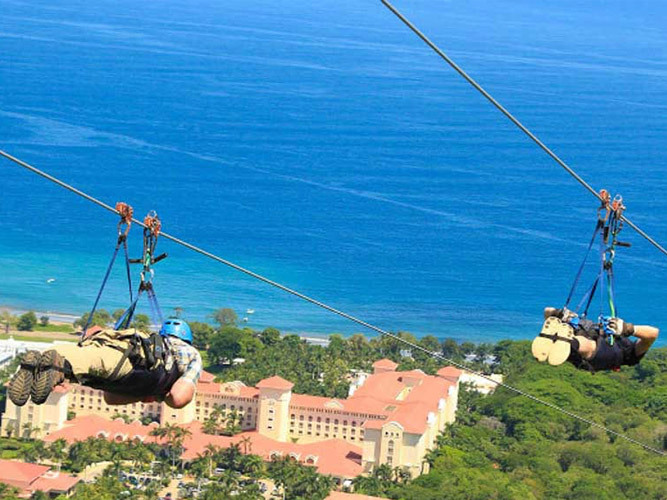 Watercrafts beach side, ziplining, and the infamous “Superman” zipline are all for the taking. This Superman zip is as close as you’ll ever get to understanding what it would be like to really fly. Your eyes water, momentum gains, and you whiz along the longest zipline in all of Costa Rica! After our morning run, mid-morning adventure, and buffet lunch at Eco Diamante, we’ll be checking into our beach side resort at Riu Palace. Hope you’ve been working off a ton of that calorie intake, because this is an all-inclusive resort and we’re there for TWO nights! That’s right. Unpack your bags and let out a huge sigh. All you can eat, all you can drink, all you can swim, all you can lounge, and tons of activities to keep you busy make this a perfect midway stop for the week. It’s important we earn our beach day with an initial beach run! Barefoot? Wet sneaks? Find the high ground? Run along the water? Choose your own adventure and get to that finish as soon as you can. We’ll have lots of water activities to choose from, the swim up pool bar is a mainstay, you can check out the spa, book a round of golf (off property and an additional charge), and then meet up with some of the crew for a sunset yoga session. A dinner and party will ensue after. What better way to say goodbye to what has been our home for the past two days! Indulge in your final buffet at Riu as you’ll have time to digest. We’ll be traveling a bit and making our way to Samara Beach. 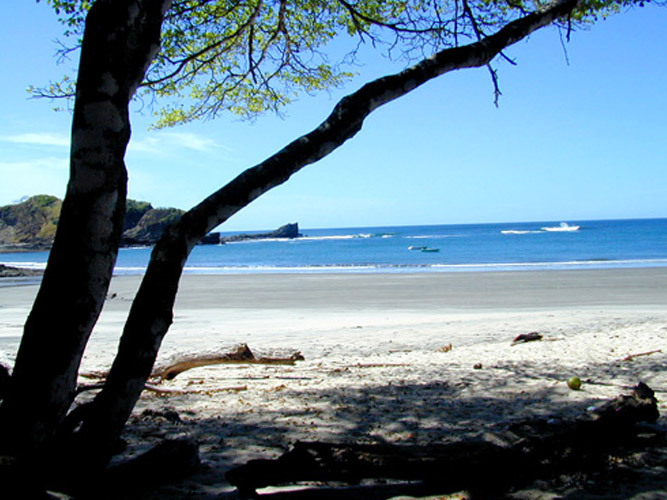 Sitting along the southern Pacific coast of the Nicoya Peninsula in the province of Guanacaste, is Samara. A small sunny town with pristine beaches and picture-perfect scenery. The town is a popular beach resort community and is considered to be one of the safest beaches in Costa Rica, making it an ideal location for getaways and low-key travel. We’ll have a light lunch in Samara, digest once again, and then we’re off to a great single trail run, with a bit of beach terrain mixed in. Post-run, it’s surf’s up! We’ll stagger surf time for the group so everyone gets their day in the sun. If you’re not surfing, maybe it’s snorkeling or hanging beach side. Just be sure to make the most of your time here, as our adventure will soon come to a close. Our 6th and final run is here! You’re so close. So close to saying you’ve risen to the challenge. From volcanoes, to cloud forests, to waterfalls, to canopy tours, to superman zips, to beach activities, to challenging courses and terrain…you are almost there! Cross that finish line, deliver the hugs and high fives, and basque on Samara beach one last time. Surfing, snorkeling, swimming, lounging, and celebrating are all in order. In true R2A fashion, it’s time to tie it all up in a bow. It’s the final party! You’ve earned your medal! You’re one of us now! Congratulations on embracing Race2Adventure! Sleep in (a bit) and don’t worry, those worn out trail running shoes won’t be needed today. Grab some breakfast and board the bus for San Jose. We’re headed back to where it all started. You’re on your own this last night. Recap the week long adventure at your place of choice with friends old and new. Reflect, laugh, and make sure to start planning R2A 2021. It’s going to blow your mind!! !